When my father died in 1995, he left behind a small life insurance policy that awarded each family member $5,000. It wasn't much, but it was the best he could do based on the fact that he had cancer. He hadn't been much of a planner, and hadn't been good with money, so that $5,000 per person was actually a significant amount. At the time, I was deep in debt. I had over $20,000 in credit card balances, and was gradually adding more all of the time. If I'd been smart, I would have taken the proceeds from my father's life insurance and used them to immediately repay $5,000 in debt. But I wasn't smart. I used $1,000 to pay off debt (and patted myself on the back for it), but spent the rest on a new computer, software, and accessories. It didn't take long to realize that this was a dumb decision. You see, when you receive a windfall, whether it's a tax refund, an inheritance, a gift, or from any other source, it's like you've been given a second chance. Although you may have made money mistakes in the past, you now have a chance to fix those mistakes (or some of them, anyhow) and start down the path of smart money management. It can be tempting (as I well know) to spend your windfall on toys, trips, and other things that you “deserve,” but doing so will leave you in the same place you were before you received the windfall. And if that place was chained to debt, you'll be just as unhappy as you've always been. Since my father died, I've received a few other small windfalls (and a very large windfall when I sold Get Rich Slowly). With time, I've developed a system for handling these situations. Keep 5 percent to treat yourself and your family. Let's be realistic. If you receive $1,000 or $10,000 or $100,000 unexpectedly, you're going to want to spend some of it. No problem. But don't spend all of it. I used to recommend spending 1 percent of a windfall on yourself, but from talking to people, that's not enough. Now I suggest spending 5 percent on fun. That means $50 of a $1,000 windfall, $500 of a $10,000 windfall, or $5,000 of a $100,000 windfall. Don't be tempted to spend more! Pay off debt. Doing so will generally provide the greatest possible return on your investment (a 20 percent return if your credit cards charge you 20 percent). It'll also free up cash flow; if you pay off a card with a $50 minimum monthly payment, that's $50 extra you'll have available each month. Most of all, repaying debt will relieve the psychological weight you've been carrying for so long. 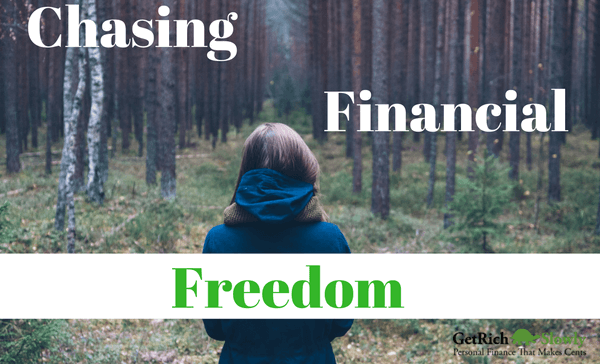 Don't underestimate the feeling of freedom that comes from no longer having creditors. Make a wish list. Allow your initial emotion to pass, getting over the urge to spend the money now. Live as you were before. Meanwhile, spend some time learning how far your windfall could go. Most people have unrealistic expectations about how much $10,000 or $100,000 can buy. Resist the temptation to spend the money now, but do run the numbers to see what you could buy. Related >> Which Online High-Yield Savings Account is Best? In the end, it's often best to take the remainder of a large windfall and invest it for growth. Today, the bulk of my windfall still sits in the same place it's been for the past five years: an investment account. When first I put the money there, I thought I might use it for something in the not-so-distant future. That didn't happen, and now I've had time to get used to the idea that I have a large chunk of money that can act as a sort of “personal insurance.” That cash eases my mind. It helps me sleep easy at night. And that's more rewarding than spending it on new toys could ever be. There are 30 reader responses to "How to Handle a Windfall". Very good points, I just received 2000â‚¬ in early inheritance from my grand parents and the whole sum went straight in to our savings account. Not going to touch that money at all. Quick story. I was working with a person who inherited a large sum of money when her neighbor passed away. She initially wanted to save that money, but there were too many temptations along the way, she ended taking out the money slowly and gradually to a point where most of the money was gone after about two year. Try to avoid the temptation and don’t mention it to other people. I like the point about using at least a little of it for yourself and your family. I received a gift from a family member once and saved/invested the entire thing. Now that he’s gone, I regret spending at least a little of it on something fun. Something that I could have shown him or told him about. I really hope my heirs will do the same someday. Save, yes, but do something memorable. Sure, I do agree with you. In my case this was just a early inheritance in order to avoid taxes. Hence this was all saved since there was no “emotional” attachment to it. I definitely agree emotion makes a difference — at least in my case! I feel guilty/awkward/embarrassed/humbled/grateful about having money I didn’t earn. I’m glad to see positive comments on this post rather than “must be nice” sort. Good ideas here on handling a windfall – I usually go with 10% for me and 90% for saving/investing/debt/etc. Do your percentages change based on the size of the windfall? I’ve had a number of windfalls in my life and each one has had an emotional component that came with the check. My father died young and his life insurance was 6 figures. My mother was in such grief that I took over her finances amid her financial anxiety and panic that the money wouldn’t last her to old age. I then received my dad’s portion of his inheritance from my grandmother. My cousins (who had a deceased parent as well but who had received a “payout” early from my grandmother) took us to court. How charming. This dragged out for years and caused family discord amongst some members. With that early inheritance I paid cash for a car, put a large down payment on my first house, paid off student loans and traveled. Looking back, I did the right things. My house is now worth 5 times what we paid for it. My only regret is that I should have purchased another house as a rental at that time (which was always my grandmother’s advice!). Sometimes windfalls can be an emotional punch so the best advice is to do nothing for a bit and try to be as objectove as you can with your plans. It would depend how that windfall came about. For example, we refinanced some rentals and got a 6-figure “windfall” – we didn’t spend a dime of it, and it’s all going to new investments as we come across them. But that wasn’t “new money” because it came out of equity in our properties. I think it would take quite a large unexpected windfall (at least 6 figures) for us to consider spending any of it on anything but additional investments or charitable giving. Between our income and savings and our general frugality, extra cash has no immediate utility (or emotional value to us) except in how it can be used to develop more cash flow through investments. Perfectly said. At this point in my life I’m more likely to view a windfall as “now I have extra tools to make the best net, to catch my own fish” rather than “hey, thanks for the mahi mahi!”. I hope everyone listens to your sage advice LMOOT. Use windfalls to improve your ability to catch more fish. 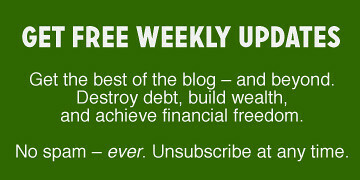 Or, use windfalls to set up passive income streams that will endure. Paying off debt, paying for things you need… ok, but if you’ve been frugal and don’t have needs like that – make the windfall a permanent part of your future income stream, one way or another. That’s how you get rich, slowly. Your voice and perspective resonates with me, good to have you back, JD. One practice that hubby and I have done with anticipated windfalls, is to write out a budget BEFORE we get it. To borrow Dave Ramsey’s phrasing, once you give every dollar a name, I can immediately implement the budget. We debate about our financial priorities and the direction we want to go before we have the money in hand. I very recently received a windfall (life insurance and inheritance) and am still deciding what to do. When all is said and done, the total will be about $120,000. So far, I have used $30,000 as a down payment on my first house and rolled over $65,000 into an inherited IRA (it was in a traditional IRA) and am planning on keeping it there for my own retirement (minus the required yearly withdrawals). The last $25,000 I should receive within the next year (government retirement account, so ridiculously long processing time). For that money, I’m really not sure what to do with it so I’ll probably not do anything yet. The emotional aspects of having so much money come about because of the death of a parent are really hard and complicate decisions about what to do with it. I’ll probably force myself to use some of it on something fun and put the rest into a retirement account or college fund. I like the 5% rule, though I imagine I’ll spend something closer to 2% just since it’s a lot of money. I’ve received a couple windfalls over the years, all of which went towards school and that wasn’t really a decision on my part, though I would have made the same decision. I’m not really the sort to make plans based on a windfall. Usually I already have ideas of how to spend money (the only difference is the source…getting money versus earning money). Therefore I am not likely to go on some big vacation because of a windfall, unless it was a vacation I was planning to take anyway, which I would have already been saving for so whether I keep the savings and spend the windfall, or keep the windfall and spend the savings, it’s all the same. Now if it were a major windfall (for me it would have to be in the mid-range 6 figures) I could probably figure a way to spend on some unplanned expenses. But my expected financial obligations are around $500,000 (so the windfall would have to be at or over that amount)…most of which will go towards investments that will earn me much more than enough for a nice, one-time vacation. So I would probably logically want to get to that point ASAP and would see spending that extra money on anything but those goals, as a step back from the opportunity of reaching my financial goals quicker. Boring, I know. Also, can someone explain the whole “When I get my tax return” phenom? First, my returns are usually less than $100 barring a surprise tax break that got me $500 one year. Second, are people really waiting to get a tax return in order to make major purchases? And it’s usually related to a “fun” sort of purchase. Wouldn’t you just save money to do whatever it is you wanted, and if you didn’t have the money, wouldn’t you have a panic attack at the thought of spending money on something frivolous (or anything for that matter) without some kind of cash net? I’m not trying to be snotty, but just about every one I know has a big grand idea of what to do with their refund. I feel a little ‘odd chick out’ b/c I’ve never felt that giddiness before at tax time. I’m not a big fan of getting tax returns either, but for some people, particularly those not good with money, it’s forced savings. I’d rather have all the money I’m entitled to each month so that I can save in some kind of interest-bearing or dividend-paying account. However, I’ve had fairly large tax refunds since buying rental properties. When it was just income from regular sources, it was easy to adjust withholding. Now I have no idea how to adjust the withholding from the job because I don’t know what income (somewhat predictable) or expenses (unpredictable) to expect with the rentals. I’m not thrilled about getting a tax return, but I do get a fairly significant refund almost every year because I do contract work and only work part of the year. And when I do work, much of my income is at the highest marginal rate. I’ve also saved up RRSP contribution room from lower earning years to offset against high earning years so it’s not uncommon for me to get low 5 figure refunds. I just do the boring thing and save all of it. But yeah, the people I know that are the worst with money are the most excited to get a refund. Most seem to spend it all on a vacation. This is usually how I treat windfalls too. Whether I earn a little extra, get an unexpected windfall, or find extra money in the budget, it all gets treated the same. Sometimes it goes towards the thing I’m working on now, or I might leave my budget as is and hit the next thing on the list. That depends entirely on the goals and when I need the money by. I’m also normally right with you on the tax returns, but this year is an odd one. I’m actually getting a bunch back. This is only because we bought our first house, and I decided to overestimate this first year until I knew how our taxes would work out. Now that those are done, I’m figuring out what to change my withholding to and how much to increase my 401k savings. In the mean time, the tax return is going towards the cost difference between a new harp and the proceeds from the sale of my old harp, a new case for said harp, and a new dishwasher, which recently kicked the bucket. Clearly, I am WAY over withholding. Ugh. Gimme my money back! I have NEVER understood giving the government an interest free loan all year just to collect some back as a “refund”. That is the behavior of a child who cannot be trusted to handle their own money year around. I foolishy spent a $6000 windfall in my twenties and learned my lesson. I agree we should all be saving towards what we want/need to do without the assistance of a windfall. I am debt free for the third time in my life and I like the idea of spending 10% since I have no debt to pay off. I also like the idea of giving a percentage to Charity or even a family member in real need like a struggling student or single mom needs a trip to dentist. As always, J.D., I enjoy your perspective and I loved the topic of this post. I just wanted to add that if one is in a relationship, then make sure you are both on board with what to do in case of a windfall. It doesn’t help if one person follows JD’s advice while their partner is spending like there’s no tomorrow. If the windfall comes from a person (inheritance or gift) I think it’s nice to consider what a giver thought was important. If your grandmother thought owing your own home is important then using an inheritance from her as a house down payment would be great. Or if your bachelor uncle gives you money because he saved all his life then using the gift toward an IRA is a nice thank you. This all can be taken too far, of course. Don’t buy a Chanel purse rather than pay-off student loans just because the money came from your fashionista aunt. Mary, I agree with you, this business of windfalls can be taken too far. Hey, some people never learn. I have numerous baby boomer friends like that… that feel they will retire comfortably on an inheritance windfall and so don’t bother with their own affairs so much. In fact one in particular who had gotten a nice windfall, inheritance in Virginia a few years back. Hey, there are always going to be people who waste a lot or all of their inheritance money… We all know you don’t have to be 18 to be foolish with money, but I’m sure extreme youth provides even less common sense, and an extra helping of foolishness. An old friend of mine squandered the inheritance money windfall his wonderful mother (who was a very, very close friend of mine since I was 14) left him when she passed away at 78 from an illness. Which upset me terribly. But what he did with the inheritance she left him upset me quite a bit also! She had sacrificed and worked hard to leave my pal and his 2 brothers a nice cash windfall and a lovely little house in a well to do area in Charlottesville, VA — which he stupidly sold for a pittance rather than keeping it in the family so to speak. And what did my pal do with all that inheritance money? He bought a pricey car… and went on a 6 month vacation to a bunch of South Sea Islands… and paid off his credit card debt — and that was it, all gone. He was 46. Should have known better. Easy come, easy go. But not at 47! Needless to say — he’s sorry now. But I must say — it’s quite the opposite for many heirs, middle class heirs, not rich heirs, many who come into an inheritance that is often less than they had hoped for. But it’s still a windfall, and most heirs respect and appreciate that, regardless. Most middle class heirs make sure they use their inheritance windfall to pay off debts, or invest, or just bank inherited cash as well as cash from a house sale, give some to loved ones, whatever. But they rarely just squander their inheritance money like my pal did. Some do, but not many these days, from what I see. In fact, many impatient heirs of estate in probate decide to get a loan on inheritance, to borrow against their inheritance, to get started on things sooner that later, rather than wait a year or two for probate to finally end. Those impatient heirs look at 72 hour inheritance loans, easy term probate loans, or loans on inheritance like 48 hour inheritance loan advances or probate cash advance funds against a trust, or whatever inheritance loans in advance, advance inheritance funds they can get quickly approved for. As soon as they are approved for a probate loan or estate loan from an established inheritance advance, inheritance loan, probate cash advance or probate loan firm like http://www.myinheritancecash.com, or some similar inheritance advance companies or estate or probate issues you can read about and study up on, at https://www.thebalance.com/probate-checklist-how-to-probate-an-estate-3505269 or maybe a people-research oriented website like http://www.quora.com. Somehow immediate probate cash seems to bring out a sense of responsibility towards the windfall they have been lucky enough to get… and they immediately lean towards doing some positive or constructive things with their inheritance money, rather than going out and squandering most of it. Especially if they’re over 18. And as far as most people involved in the estate, their attorney, admin, older relatives, etc. are concerned — as far away from 18 as possible! No one likes to see an inheritance or any windfall frittered away and wasted. Especially older people, who know how easy it is to waste money, and how hard it is to get it and keep it! I think I would probably be more 10% fun, 90% savings/debt…until the windfall got ridiculous (which to me would be more than $10,000). The most extravagant thing I could think of that I don’t *need* would be a yoga gym membership, which for a year unlimited would be about $1000. I suppose if I got like $100,000, then I would set aside $10,000 of it to buy a new car (my current car is 14 years old). But I would not actually buy the new car until my current one died. So I’m not sure where that falls in the scheme of things. Great post, J.D.! Sure do miss you on this blog. first time posting a response as i have been moved…..to a degree. i am surprised that only jean mentioned anything about giving unto others (not necessarily with any religious overtones, as i am not!) my dad’s favorite book was magnificent obsession and we used his death and windfall to educate his heirs and grandchildren as to the wonderful aspect of blind charity (giving without any stings attached or even knowing the donee.) its a feel good thing………..try it!! Great points, this should be printed out and given to everybody who wins the lottery. Thanks for this article. It’s far too often that people simply run out and buy that new car, big screen TV, or vacation when receiving a large sum of money. We ought to instead take a couple days or weeks to really think about the best use of that money over time. After paying off high-interest credit cards and other short term necessities like taxes due, the best course of action is to invest in a long-term oriented mutual fund or ETF. Invest and forget. I recently had $7,000 returned to me that was the proceeds of stock that was held by the state of Delaware because it was unclaimed by me (forgot to update my address changes). First thing I did was try to put half of it towards paying down some debt. Second thing I did was invest the rest in a local ETF (which I intend to hold for 21 years as a part of my Get Rich Slow strategy). The only change I might make to J.D.’s recommendations is to fix the broke things before paying off debt. Especially tending to preventive medical issues before they become much larger medical expenditures. Or dealing with a small leak before it becomes a major issue in your house. Or if you want, use the 5% fun money toward fixing those things first.